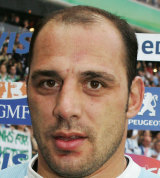 Longo represented Argentina at three Rugby World Cups and won 51 caps for his country as a powerful No.8. The Clermont Auvergne forward made his international bow against Wales in Buenos Airies in June 1999 ahead of the World Cup. Longo scored five tries in his 51 appearances for the Pumas and was a mainstay during his eight years in the international set-up. His final international appearance came against France at the Park des Princes in October 2007 as the Pumas crashed out of the World Cup.